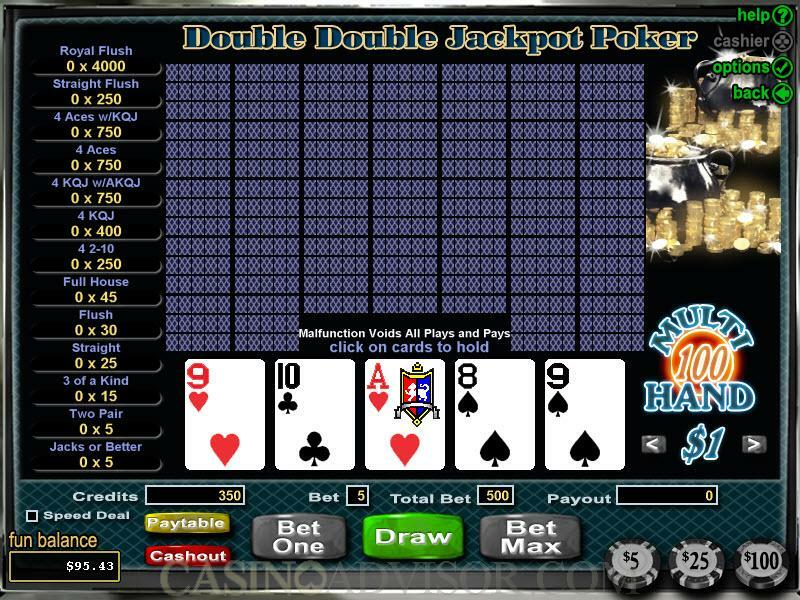 Double Double Jackpot Poker is a 100 hand multi-coin variant of video poker. The hands are dealt in the large central area, to the left of which the payouts are calculated. The coin dimensions are displayed to the right of this area. Immediately below the central area are displayed the credit balance available for playing the game, the bet per line, the total bet and the payout after the game is over. The buttons required for the game operations are displayed below that. At the bottom left is the player’s overall casino account balance and at the bottom right are the chips used to transfer credits from this balance to the game. The player begins by choosing the coin denomination. His options range from 0.01, 0.05, 0.25, 0.50 and 1.00. Next the player has to transfer credits from his casino account to the game. This is done by clicking on the appropriate chips. This amount is displayed in the ‘credits’ cell. The player’s casino account balance is appropriately reduced. The player has to choose the number of coins wagered per hand by clicking on the ‘Bet One’ button the appropriate number of times. If the player wants to wager five coins per hand he can click the ‘Bet Max’ button. The credits wagered per hand are shown in the ‘bet’ cell and the credits wagered in the game as shown in the ‘total bet’ cell. Once the wager is placed the amount in the ‘credits’ cell is appropriately reduced. The player must ensure that he transfers sufficient balance in order to cover 100 hands of the chosen coin denomination and the chosen number of coins. If a player wagers with a coin denomination of 0.01 and with 1 coin per line he wagers the minimum amount of 1.00 per game. If a player wagers with a coin denomination of 1.00 and with 5 coins per line he wagers the maximum amount of 500 per game. After placing the wager the player clicks on the ‘Deal’ button to start the game. The game is played in the normal video poker way as described in detail in the Rules section. After the hand has been played out the player’s pay out is shown in the ‘payout’ cell and the amount is automatically credited to his game credit balance. If the player has sufficient credits he can start another hand immediately. Otherwise he may need to transfer more credits by clicking on the chips as described earlier. Once the player has completed the session he can click the ‘cash out’ button and transfer the credits to his casino account. 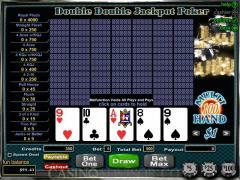 Interested in reading more detailed information about Double Double Jackpot Poker? If so Click Here for more details.